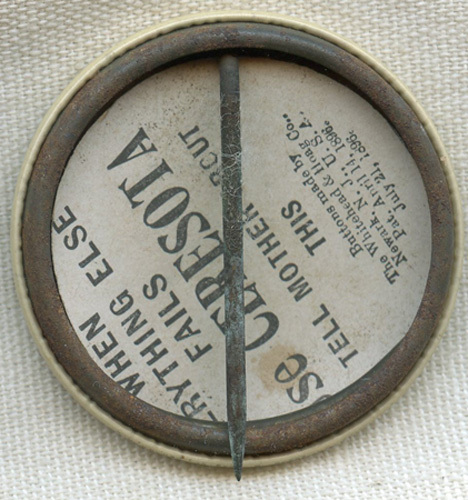 ARTIFACT: This is a circa early 1900s celluloid advertising pin for Ceresota Brand Flour from the Northwestern Consolidated Milling Company of Minneapolis, Minnesota. The pin is by Whitehead & Hoag of Newark, New Jersey, and displays the company �s optimistic claim: THE BEST FLOUR ON EARTH. SIZE: Approximately 1-1/2� in diameter. CONSTRUCTION/MATERIALS: Celluloid-wrapped tin, paper backing. MARKINGS: WHEN EVERYTHING ELSE FAILS USE CERESOTA TELL MOTHER ABOUT THIS BUTTONS MADE BY THE WHITEHEAD & HOAG CO. NEWARK, N.J., U.S.A. PAT. APRIL 14, 1896 JULY 21, 1896. CONDITION: 8- (Very Fine-Excellent): The pin shows only minor aging and oxidation to the pin only.